Is it happening? Is the ABA (Applied Behavioral Analysis) therapy that Zack’s been doing for three weeks really opening new doors in his brain? I pray daily that it will, and I think it is. Interesting doors. Hopeful doors. Or maybe it’s just having a puppy in the house. Or the sun finally shining after eight months of cloud cover. Or one of Jay’s healthy morning smoothies that Zack drinks willingly even as I turn up my nose at the latest recipe. Whatever it is, I’ll take it—with delight! Especially what Zack did after dinner the other night. He stayed at the table as Jay and I finished our meal, and he turned on his iPad to begin repeating his show again and again. There’s nothing unusual about that, but this time he did it with flair. Zack rewound and paused his show, “Theodore the Tugboat.” Then he bent over and touched the arrow to start it again with his nose. I laughed and he joined in. And then he purposely repeated the action several times, always looking up with a sly grin and bursting into laughter. Some might think I get overly excited about the silliest things. But it’s so much more than that. Zack was purposefully making a joke to make us laugh! He was sharing humor with us. New doors opening in his brain. Humor doors. Our man-boy has a great sense of humor that he and I share in very silly, nonsensical, and usually highly physical ways. This was an extension of that—a new bridge of communication. Fans are a marvelous thing! Another thing Zack and I share is a love of wind. 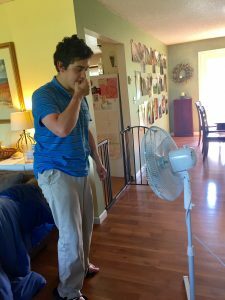 Especially when it’s hot outside, we want—you could even say need—a fan blowing on us. There is a small fan on my bedside table that Zack turns on every day, regardless of the temperature outside. Yesterday afternoon when the temperature was 85 degrees, I went into the attic and brought down one of our standing fans. It helped cool the living room, and I brought it into Jay’s and my bedroom for the night, giving Zack the small fan for his room. This morning, as I sat on the couch, I saw my servant-hearted man-boy trying to get the large fan through a small opening between my bedroom and the living room. I told him he needed to go through his dad’s office and he backed up, bringing it out that way. As he was working to untangle the cord and plug it in, I got up to help and he yelled—a sure sign that he wanted to do it himself. A yell may not be our end goal for the way to communicate, but Zack wanting to do it himself without help certainly is. He was able to make that clear. I stopped and let him do the work, which was quickly accomplished. Another door opening in his brain. Self-sufficiency. Sensing a more complex need and meeting it. 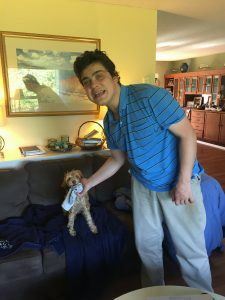 Zack posing as he hands Gaby a sock. One more thing: Zack’s been playing with Gaby, our puppy for long stretches of time. I peek in on them, from another room, and see him taking something away from her that she should not be chewing and replacing it with a toy. Or he is pulling on her rope while she holds on to the other end. Or he pries her mouth loose from holding on to his pant leg. He is helping to train her. He is aware. Another door opening in his brain. 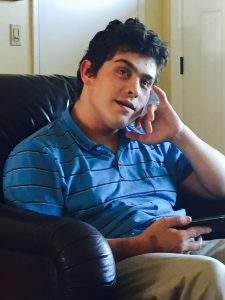 Seeing himself as a caregiver and teacher. Whether it’s ABA Therapy or not, I see changes, doors opening, and I am thankful. Wonderful! I’m excited with you. These are big things and must be awesome to behold! Thanks, Melissa. I appreciate your years of praying for Zack! I love how you celebrate your boy. He is loved dearly. And He is God’s precious child.